While there was a moment for Abramovic to digest all the frenzy she had whipped up, this moment was instead spent with The Life and Death of Marina Abramovic, a confusing collaboration of the artist with Willem Dafoe, Robert Wilson and Antony, of Antony and the Johnsons, which marked the artist’s return to the Manchester International Festival. 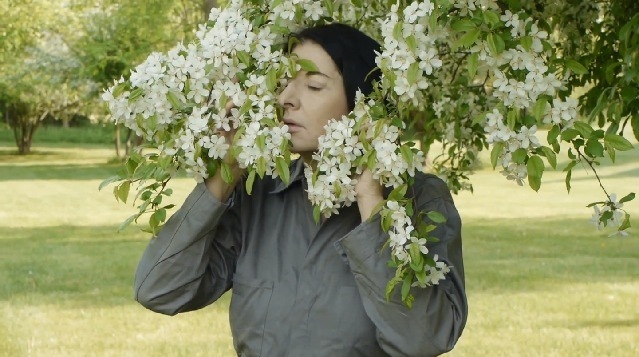 It was difficult to tell how all this concentration and dedication to one’s own mythology was to be read – especially in an era that prefers jagged-edged irony to Abramovic’s brand of Deep-Souled sincerity. By 2012, we were more than a little wary, even as we heard the raves about the critically-acclaimed The Artist is Present, Abramovic’s bio-pic, which can be found at the tellingly-titled address: www.marinafilm.com. The site describes the artist as “A GLAMOROUS ART-WORLD ICON, A LIGHTNING ROD FOR CONTROVERSY, AND A MYTH OF HER OWN MAKING,” seemingly owning the growing accusations over where the Art ends and the Ego begins. But wasn’t that always her question? 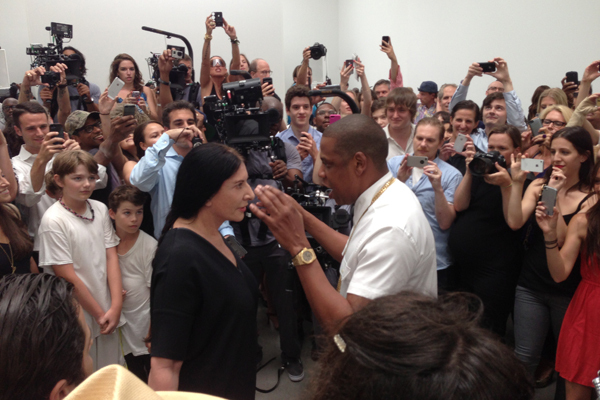 Marina Abramovic and Jay Z during the filming of the video for “Picasso Baby.” Photo David Velasco, Artforum. Still, the place and application of performance is changing, and why shouldn’t it change? Why shouldn’t there be institutions of this nature? Why should we wait for performance to affect change within the existing museums, when it could spawn its own, more flexible model? These are potentially meaningful questions and they deserve room for debate. That room, however, got occupied rather quickly when Abramovic supplemented her Kickstarter page with a video of Lady Gaga performing “The Abramovic Method.” The method apparently subscribes to that unfortunate belief that for performance art to be “serious,” one must be naked. And so it was. Word of Lady Gaga buck naked in an “art” video exploded across the internet, garnering a massive audience for the effort, but also putting a bit of a damper on those questions about what this institution could be. Honestly, having watched the 2 minute video of the pop singer demonstrating some of the method techniques, we have to confess this really just looks like the worst summer camp ever. Anyway, we offer it for your consideration. This entry was posted in New York and tagged David Velasco, Jay Z, Lady Gaga, Manchester International Festival, Marina Abramovic, Marina Abramovic Institute, performance art, Picasso Baby, Sarah Nicole Prickett, The Artist is Present, The Life and Death of Marina Abramovic. Bookmark the permalink. Grrr! Interpreting! Damn you, spell checker!